WordPress powers millions of small-scale business websites and blogs. It was originally built as a blogging platform but has since expanded into a content management system with many plugins that can add advanced functionality like ecommerce. There are some large-scale websites using WordPress, but its target is small to midsize websites. Drupal meanwhile is built with larger websites in mind and can easily expand as your website grows. At its core, Drupal was designed to handle large amounts of content, giving it the ability to power websites that contain thousands of pages while remaining fast and secure. Drupal also has many modules available that can add advanced functionality to your website. While Drupal might be overkill for many small blogs and business card websites, WordPress can handle these types of sites very well. Drupal however should be considered for websites with many pages and different content types, as it is designed to scale to accommodate large amounts of content. When working with many different types of content, Drupal really shines. You can create custom content types and easily integrate them into multiple areas of your sit. On the other hand, you need to install plugins like Advanced Custom Fields to truly create custom content types in WordPress. Once content types are determined and set up, both Drupal and WordPress make it very easy to add content. With minimal training, almost anyone can learn how to add and manage content. For most users, the admin interface for both WordPress and Drupal will take a little training and practice to get used to. WordPress arguably has a more intuitive and well-designed interface that many people prefer, while Drupal’s interface has a more technical look and feel, which may seem more intimidating to some. Both CMS have plugins and themes that can make the admin experience even better, and after training the interface’s ease of use comes down to a matter of preference. A base Drupal installation contains controls for user-permissions and is well suited for websites with many content-editors. Each content type can be fine-tuned on who can access it or edit it. WordPress has some user-permission controls but they aren’t as advanced out-of-the-box. However, again, WordPress has plugins to manage user-permissions—but adding these supplemental features require the developer to perform additional system configuration. WordPress and Drupal each have numerous plugins/modules that can add almost any functionality you might need. 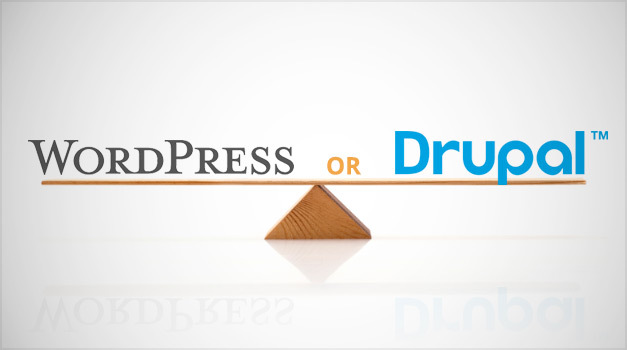 Because of its popularity, WordPress has more plugins than Drupal has modules, but many of WordPress’ plugins have similar functionality and end up competing against each other. Drupal may have fewer modules, but these modules tend not to duplicate functionality because developers frequently work together to create or enhance functionality, resulting in modules that are very strongly supported. When it comes to choosing an open source content management system, there is no “one size fits all” solution. Drupal and WordPress are very advanced after years of development and either one would be sufficient for most websites. Both CMS have a great community behind them and information, support, and training can easily be found via a quick search. They can be made do almost anything with additional custom development. When making your selection, you should start by evaluating how the default functionality of each CMS can meet your project needs. From there, you should determine what additional functionality is needed, and if there are plugins available for this functionality, or if custom development will be required. Frequently, when deciding whether to use WordPress or Drupal on a project, we find that the systems are pretty evenly matched. When this happens, Street Level Studio will generally select WordPress for small- to mid-scale websites and Drupal for mid- to large-scale websites.